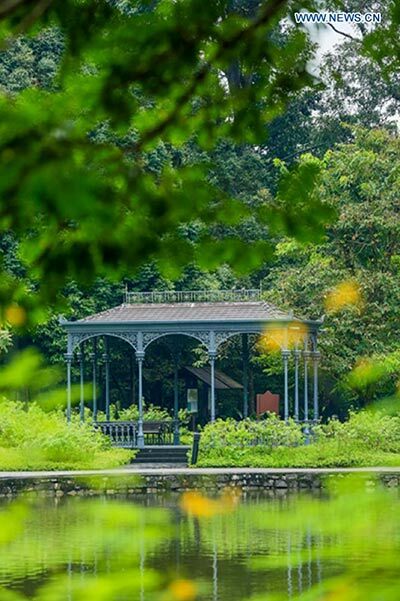 The Singapore Botanic Gardens is now a UNESCO World Heritage Site after it was inscribed at the 39th session of the World Heritage Committee in Bonn, Germany, local TV Channel NewsAsia reported Saturday. The decision was met with cheers from a jubilant Singapore delegation, led by Culture, Community and Youth Minister Lawrence Wong. The 156-year-old Singapore attraction joins more than 1,000 UNESCO World Heritage Sites in some 160 countries. It is the third Botanic Gardens to be listed as a World Heritage Site after Kew Gardens in England and the Padua Gardens in Italy and Singapore's first World Heritage Site. The inscription comes almost five years after a feasibility study by the authorities found that the Botanic Gardens is Singapore's best candidate to achieve UNESCO World Heritage status. Singapore officially submitted the gardens' nomination dossier to UNESCO in January last year. In September last year, a technical assessor from the International Council on Monuments and Sites (ICOMOS) visited the Gardens. In May, ICOMOS recommended the gardens to be inscribed as a UNESCO World Heritage Site, saying it is an "exceptional example of a British tropical colonial botanic garden in Southeast Asia". Still, the final decision was made by the 21-member UNESCO World Heritage Committee. Before he left for Bonn, Minister Wong said he was optimistic about the bid, adding that the World Heritage status would strengthen conservation efforts at the gardens. The Botanic Gardens spans 74-hectares and includes the National Orchid Garden which has over 1,000 orchid species and 2,000 hybrids on display.